Last night I was needing a quick and easy dinner that used a pound of ground beef and decided to try out this recipe because EVERYTHING that I've made from Taste of Home is a hit. I had pretty much everything on hand (I did have to stop in for sesame oil) and when the meat was done I realized that in a random stroke of luck I had recreated one of my VERY FAVORITE meals EVER! A few months ago the country club started serving these AMAZING Thai Chicken lettuce wraps. It was love at first taste. Ground chicken in this incredibly tasty sauce wrapped in crisp bibb lettuce. While the meat was simmering I tasted it and was absolutely giddy that it was pretty much the exact flavors in my beloved chicken wraps from the club. I quickly called Dave and asked him to grab some lettuce on his way home and my new favorite easy dinner was born. Step 1 - Brown the ground beef with the sesame oil and garlic. Drain. Step 2 - Throw in the brown sugar, soy sauce, ginger, salt and pepper. Stir. Simmer. 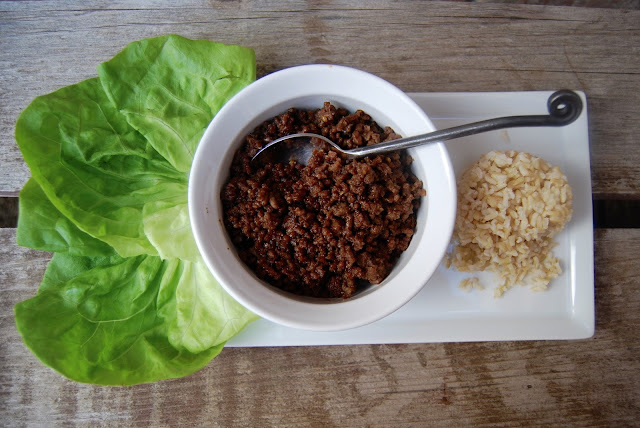 I served mine with bibb lettuce and brown rice to make lettuce wraps and they were AMAZING!!! The original recipe calls for red pepper and green onion, but since I was serving these to my kids I left those out and I thought it was perfect. If you like more spice you can try adding them in. For the kids I actually just mixed the rice and beef together and tore up the lettuce and mixed it in. Y'all. Make these tonight. And then make them the next night again because you won't have any leftovers. Can't wait to hear what y'all think!!! Those look amazing! That'll be on our menu next week for sure! I make lettuce wraps with the premade Aidell's teriyaki and pineapple chicken meatballs. They're relish and so, so easy. I am making these tonight!!! Like you, I just have to pick up sesame oil. Thanks!!! These look so good! I love a good lettuce wrap! These look so so easy and delicious! Putting it in my list for next week. Can't wait to try these! Thanks for sharing!!! Yum! Looks easy and good! Thanks! Making these for lunch today, yum! Yum! I can't wait to make this for my family! Just one question - do you use ground chicken or ground beef? It says one in the intro and the other in the recipe. Thanks! Those look and sound so good! I have never tried lettuce wraps! I made these during my lunch hour for our dinner tonight! I made a lb of gr beef and a lb of gr turkey. They turned out amazing! Thank you for the wonderful recipe! I made this for dinner tonight and it was easy and delicious! Thank you for posting the recipe. I made these tonight and added shredded carrots and chopped peanuts as toppings! sounds great, but do we use ground BEEF or ground chicken?? Any recipe that is titles "insanely easy" has my name all over it!! Just made this tonight!! So good! This was amazing!! Thank you!!! Made this last night for the in-laws. Everyone ate it up!! :) Hubby wants to know when we can have it again! Thanks Andrea! !